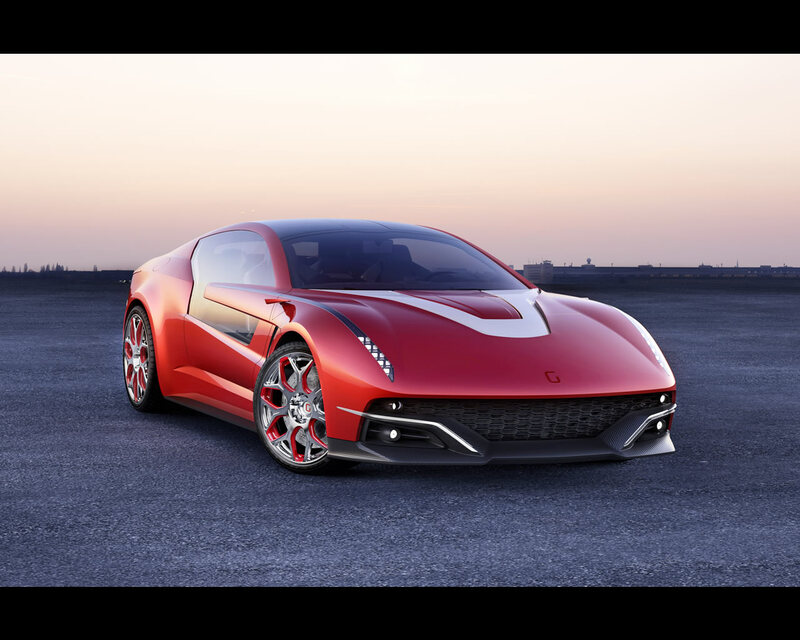 Brivido was designed, engineered and manufactured in the Ital Design Giugiaro plant in Moncalieri near Turin. Aluminium, carbon fibre, and glass are the materials that define the Brivido’s exterior. 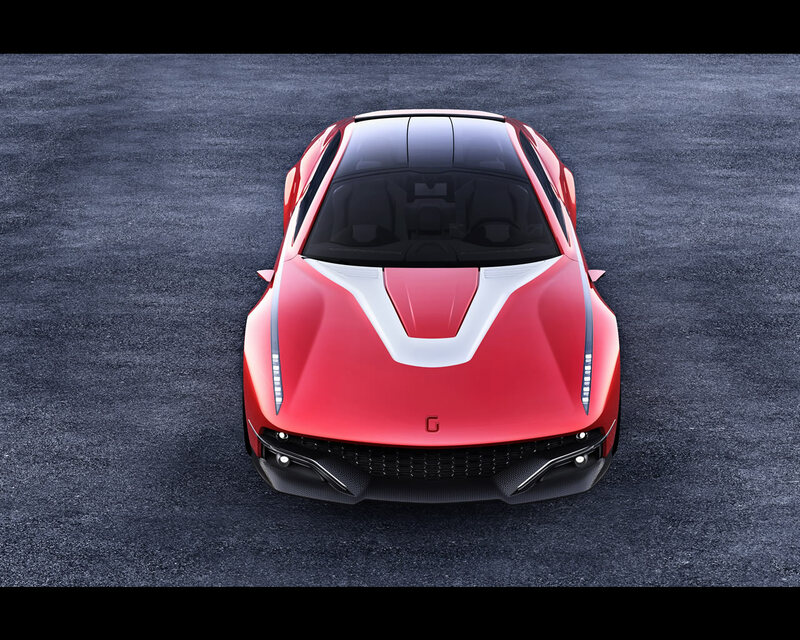 The lines of the body, painted in Xirallic pearl lustre red, are sinuous and aerodynamic and accentuate the sporty, elegant character of this latest Gran Turismo from Giugiaro. The windscreen, roof rear window, and large door windows form a glass dome that lets natural light pour into the passenger compartment. There the occupants are surrounded by an exclusive level of finish and high technology, whilst they enjoy the surrounding scenery and urban landscapes as they travel. 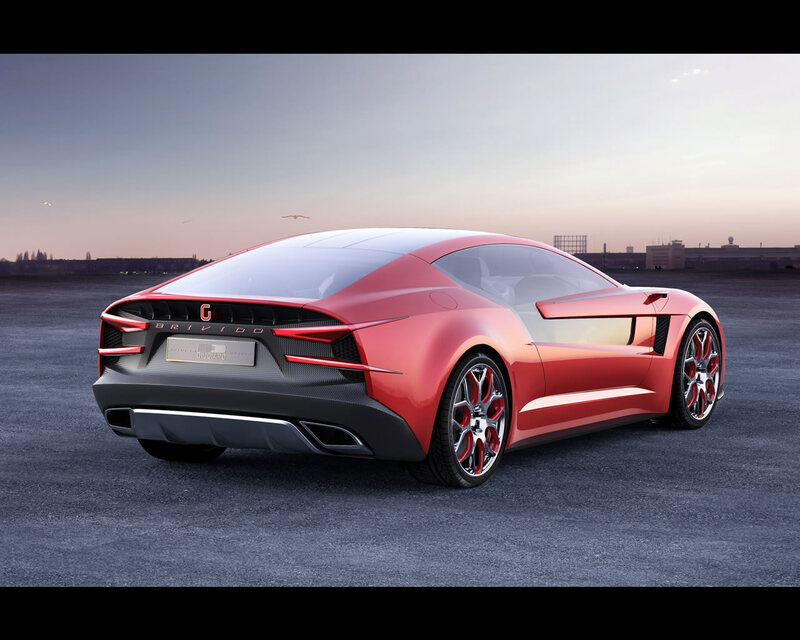 “This is a quest for a genuine four seater,” continues Giugiaro, “to offer comfort and visibility, especially for the rear passengers, which is usually sacrified in this type of vehicle. As always, I’ve tried to offer solutions which can be achieved practically. 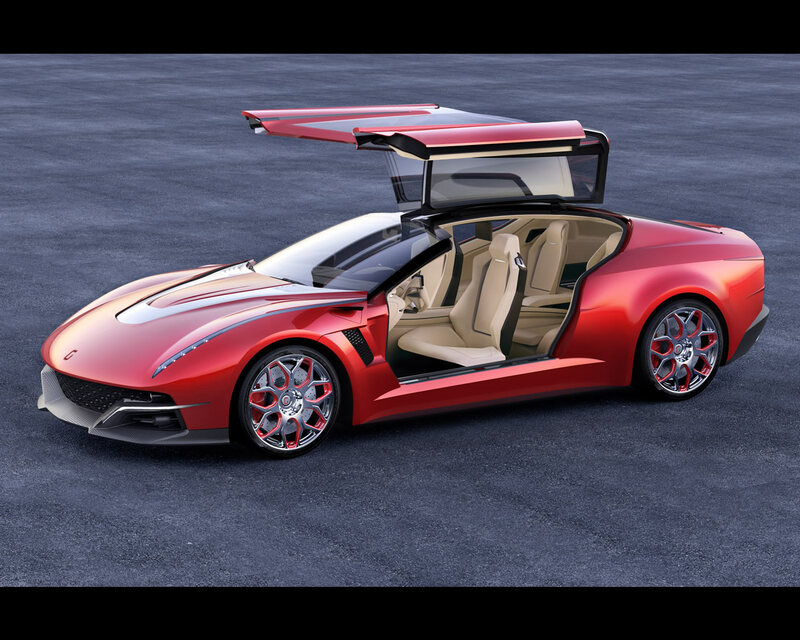 The inclusion of a pair of wide doors that rise like gull wings is the only "exotic" concession which makes the Brivido a show car. The rest of the solutions are perfectly applicable for vehicles destined for the market. The rear passengers, specifically, can access their seats without having to duck down or lower the front backrests. Instead they can enter the vehicle easily and naturally". The side view is dominated by the specially designed single door which uses glass as a genuine structural element This allows all occupants to access the passenger compartment at the same time. The waistline hugs the curve of the wheel arch and is interrupted by the door's side window, which in turn continues below the waistline to significantly increase the transparent surface. As on the Structura prototype, this feature offers the driver increased visibility when manoeuvring as s/he can easily see the pavement to the side of the car. At the same time this allows the rear occupants to enjoy great outside visibility. To facilitate window-­‐down interactions such as toll payments, a small portion of the glass can be lowered electronically while the rest remains fixed. Visibility is also a watchword on the outside of the passenger compartment as the Brivido showcases real innovation in exterior lighting. Thanks to LED technology, the headlight clusters are not only functional, but also represent a never before seen stylistic feature. Extending 2600 mm from the front bonnet, each cluster hugs the sinuous lines of the body and finishes midway along the side panel, at the height of the side door. These clusters thus also act as both sidelights and direction indicators. "For several years now, thanks to new technologies like LEDs," continues Giorgetto Giugiaro, "even quintessentially functional elements like light clusters have become something more: a distinctive element and a design signature. With these innovative light clusters we are confident that the Brivido will be instantly recognizable even in the total darkness of night." 3 The side of the Brivido hides a final technological treasure: the side mirrors have been replaced by an innovative system comprising of two cameras which literally emerge from the body. When the control is activated, the wings concealing the two micro-­‐cameras, positioned at the height of the side air intakes, open up 90 degrees and activate the cameras. The camera images are then displayed on monitors built into the steering wheel column. From the front we are greeted with an aggressive, ultra technological front end. The vehicle is equipped with a single carbon fibre panel that occupies the width of the vehicle. This allows ample air flow to cool the engine and also acts as rear spoiler. On top of this there are the DRL system, the driving lights, and the fog lights. The tail end, also in carbon fibre, flaunts two diagonal friezes that diverge from the centre and continue along the body, housing the rear light clusters, the brake lights, the indicators, and the rear fog lights. As well as the rear windscreen, which offers access to the titanium fibre covered luggage compartment, there is a small spoiler that is activated electronically at high speeds to ensure optimum road grip. Finally, the large side exhausts frame the race inspired flow deviator. The generous surface of the bonnet, emblazoned with the inlaid “V” in satin aluminium that contrasts with the red paint finish, conceals a 3000 cc engine which offers 360 HP. "The satin aluminium frieze," points out Giorgetto Giugiaro, "is not just a simple aesthetic quirk. We have included it in order to remedy the problem of hard spots and to achieve a lower profile. The red bonnet hides the engine and rises in the event of impact with a pedestrian to soften the impact. Beneath the "V" structure, we have housed actuators directly onto the engine basement, making it an active safety system. Here, once again, what seems like a designer's quirk is actually a concrete solution to a problem". 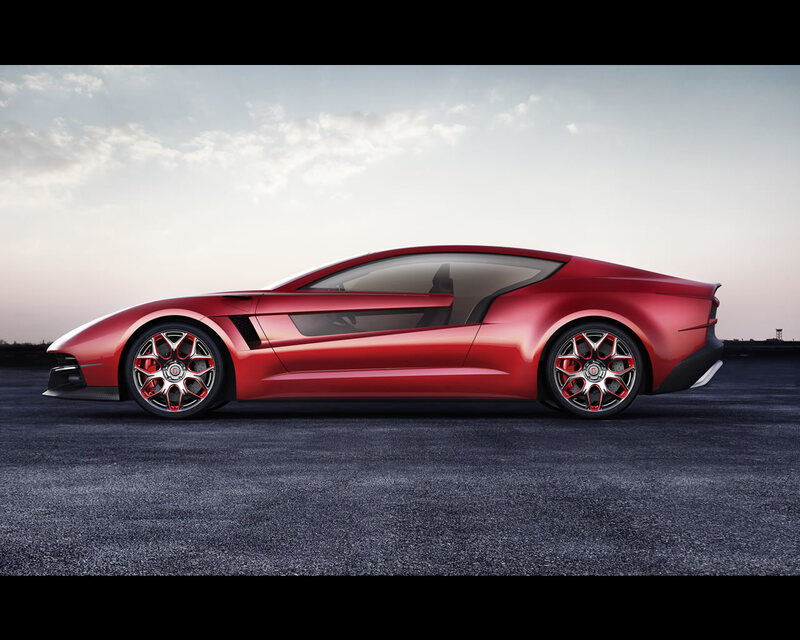 The Volkswagen Group Electronics Research Lab (ERL) in California collaborated with IDG to develop and build the interactive electronics and displays for the Brivido. This includes a unique docking system in the dashboard allows an iPad to be completely hidden away or, with a gesture of the hand, partially exposed to work in a “Minimal” interaction mode. The ERL also helped to create the climate and comfort controls in which the driver and passengers can access “Basic” and “Extended” features on a capacitive touch-screen. Enhancing the transition between these modes, physical buttons emerge from the control surface when needed, and hide away when not needed. Technology, roominess, ergonomic design, comfort, and luxury are the watchwords that characterise the interior trim of the Brivido. The cabin offers a genuine open space where a 4 unique environment encases the front and rear seats and the luggage compartment in a continuous solution, thanks in part to the use of extremely durable and lightweight Titan-­Tex® titanium fibre. The dashboard is structured symmetrically for both driver and passenger. Key information is displayed on the two LCD monitors housed inside two binnacles, one located behind the steering wheel and the other above the iPad dock. This allows the passenger to access the same information as the driver (journey, speed, rpm, etc.) or manage the options for on board entertainment. 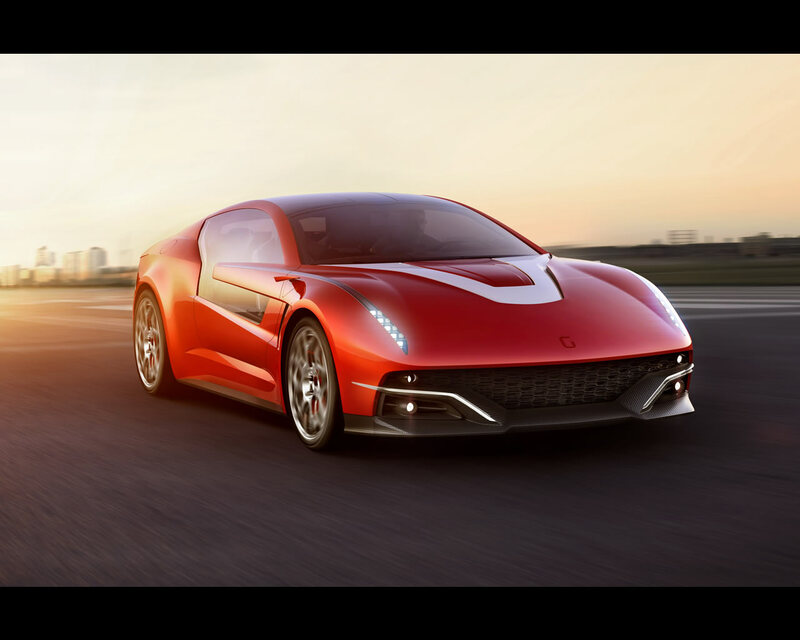 Italdesign Giugiaro has patented its specific steering column design. At the top of the steering column are two monitors onto which images from the side and rear cameras are displayed. In this way, the driver has complete control of the vehicle without ever having to take his/her attention off the road. The main controls are housed on two touch sensitive panels on the spokes of the steering wheel. The left hand panel is used to operate the infotainment system, the lights and the graphic interface on the dashboard, while the right hand panel is used to manage the climate control system settings. With just a simple touch, the driver can select the driving mode of the Brivido: “Comfort" or “Sport”. The dashboard on the passenger side houses the iPad integration system. On the tablet, the Brivido application allows the passenger to control media, navigation, and access online content from his or her lap. The passenger can then stow away the entire tablet in the dashboard via an automatic mechanism or partially dock it to use as an interface area. S/he can then control the media and navigation content in the passenger binnacle display. In line with the current fashion trends, the Brivido exudes an understated elegance. For the interior furnishings, the Color & Trim department at Ital Design Giugiaro invested in research and development on methodologies and materials, opting for a sewing method never used before in the automotive sector: raw cut seams. The hides, specially produced for this prototype, are dyed in two contrasting colours light on the “upside” and dark on the “backside.” When it comes to seaming, the hides are bonded and raw cut to enhance the thickness, which is otherwise usually folded under and therefore hidden. In this way, the light dark chromatic contrast creates a graphic line that outlines and emphasises shapes. The front seats are asymmetrical with a cushion overhanging the door sill on the outer sides. This enables the occupants to get in and out of the car with ease. Occupants sit on this "protruding wing" and slide comfortably inside. The sides of the rear seats house an LED system that makes entry easier in low visibility by optically following the design of the seats. Hiding inside are 3D glasses which make up part of the infotainment system. Wearing them allows passengers to watch a film, access travel 5 information or, by connecting to the Brivido's cameras, watch the road. The controls for adjusting the climate are housed on a touch-screen monitor that descends from the ceiling on request. The tunnel accommodates the fourteen buttons that activate all the main controls (door opening, parking brake, stability control system, lights) and the 8 speed automatic transmission, as well as contains the classic storage compartments and cup holders. The display in the middle of the dashboard replicates key information on the climate control system, fuel consumption, and the hybrid system configuration. Depending on the graphical configuration of the display, the buttons required to activate and deactivate the corresponding functions emerge from the dashboard alongside the monitor. New touch-screen technology and the experience of high-­quality rocker switches come together to create a new control system. About the ERL Located in the heart of Silicon Valley, the Electronics Research Laboratory represents the Volkswagen Group in applied research and development. Our mission is to develop innovations and technologies for future generations of cars, and to transfer technologies from many industries into the automotive domain. We design and build technical solutions that assist the driver in safe, intelligent, and enjoyable interaction with the vehicle environment. 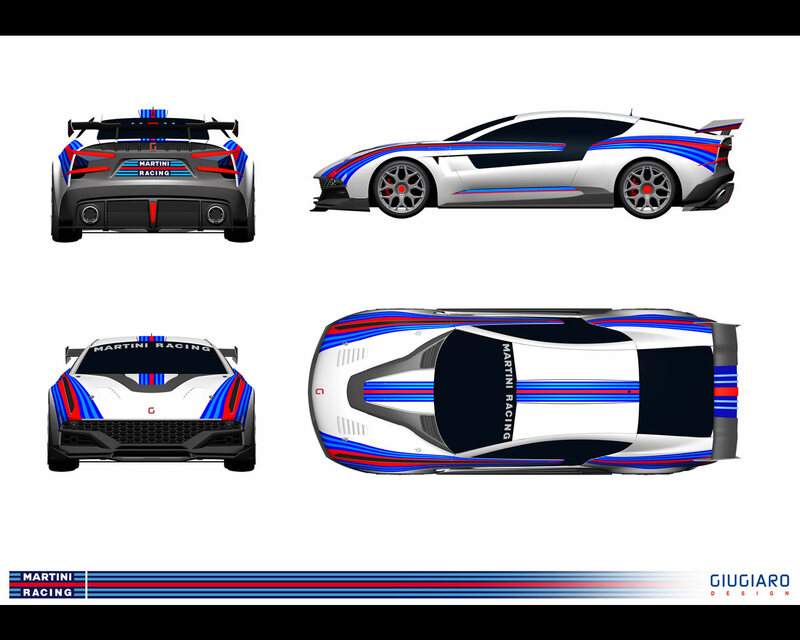 The Brivido GT Martini Racing exhibited proposes the typical GT racing features: miniskirts, bumpers and bonnet redesigned so to enhance aerodynamics and two big spoilers granting stability. Martini Racing is the name under which various motor racing teams raced when sponsored by the Martini & Rossi, now part of the Bacardi Group Ltd. Martini's sponsorship program began in 1968. The race cars are marked with the distinctive dark blue, light blue and red stripes on (most often) white or silver cars. The cooperation between Giugiaro Design and Martini Racing dates back to the 80s and to the projects of graphics for off-shore and racing cars, packaging and accessories.